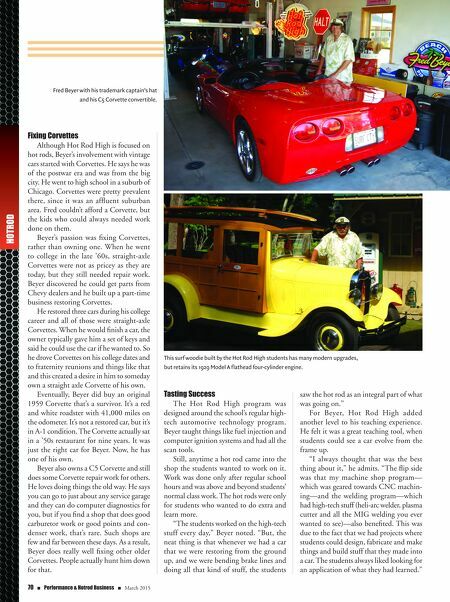 March 2015 n Performance & Hotrod Business n 71 According to Beyer, a student can study in school all day long, but he or she won't really feel good about it until they can apply it in real life. "You can learn to read recipes for the rest of your life," he opined. "But it isn't until you cook that cake or favorite meal and you get a chance to taste it that you enjoy the success of what you learned. And that's what I think Hot Rod High did. It gave the students a chance to taste success. And the cool part about the students tast- ing success was that other people saw it, recognized it and said, 'this is good stuff.' When the students—not me—got that recognition, it was clear that the program was built for students to be recognized for what they had done. It worked out really slick." The Old & the New While the students were fascinated by the old-school technology, Beyer had to be careful to avoid leaving the impression that he was teaching "antique" skills. He incorporated both old and new technology into his projects. On the first T-bucket rods the stu- dents built, they purposely avoided using a typical prewar straight axle setup like you would find on the front of a Model A Ford. The kind of arrangement where a beam axle is supported with a bow-type spring. Beyer happened to be working with a man who was designing chassis for sprint racing cars at that time. The man told him, "If you're going to race it or have it on the road, you need something that really performs well, too." He designed the complete front sus- pension setup. It was similar to that of a racing car with all tubular construction, all independent front suspension, rack and pinion steering, coilover shock absorbers, disc brakes and all kinds of cool stuff. So it turned out that Beyer's students not only worked on an "old school" car, but wound up building one that drove like a new car. That was a key part of the teach- ing experience. Beyer knew that he would be criticized for teaching only old technol- ogy, which wasn't really appropriate today. But he knew that if he created a blend of the old with the new, he could then have a win-win deal. Beyer says anyone interested in Hot Rod High can contact him through the website. Any requests he gets he tries to answer. "I'll even sign up for band jobs or piano playing gigs or stuff like that," he laughs. "But my real goal is to tell peo- ple what we have done, especially other instructors or parents who might go back to their schools and ask, 'How come you're not doing something like this?'" When Beyer started Hot Rod High, his buddies used to ask, "How do you get away with this stuff, because it seems always you're pretty far out of the box with what you do." But Beyer says he knew the program would work. "Nothing helps prove that more than success," he feels. "We have now done TV segments on Hot Rod High and we were written up in several publications. Some other good things have happened, too. We get lots of calls and some good publicity." 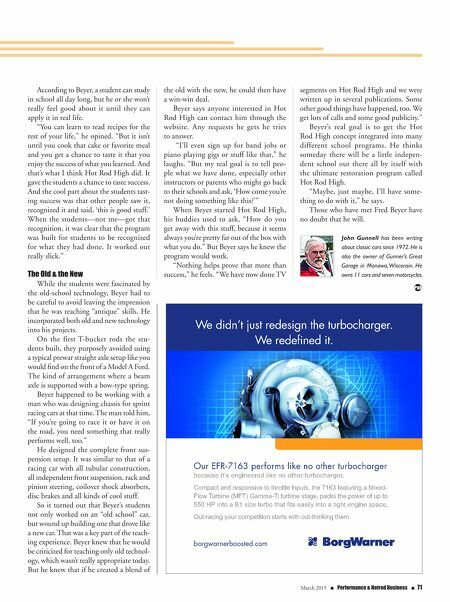 Beyer's real goal is to get the Hot Rod High concept integrated into many different school programs. He thinks someday there will be a little indepen- dent school out there all by itself with the ultimate restoration program called Hot Rod High. "Maybe, just maybe, I'll have some- thing to do with it," he says. Those who have met Fred Beyer have no doubt that he will. John Gunnell has been writing about classic cars since 1972. He is also the owner of Gunner's Great Garage in Manawa, Wisconsin. He owns 11 cars and seven motorcycles.